I bought this bag on eBay for $10. This is now the most expensive bag I've ever bought. It's just a brown paper bag with the words "The Official Y2K Barf Bag" stenciled on it. It's cheesy and wasn't worth the cost, but I won't disparage Bob Jones about it, because he didn't post a photo of it and I bid on it sight unseen. Oh well, at it's not like I collect rare coins and bid $20,000 for some coin sight unseen. 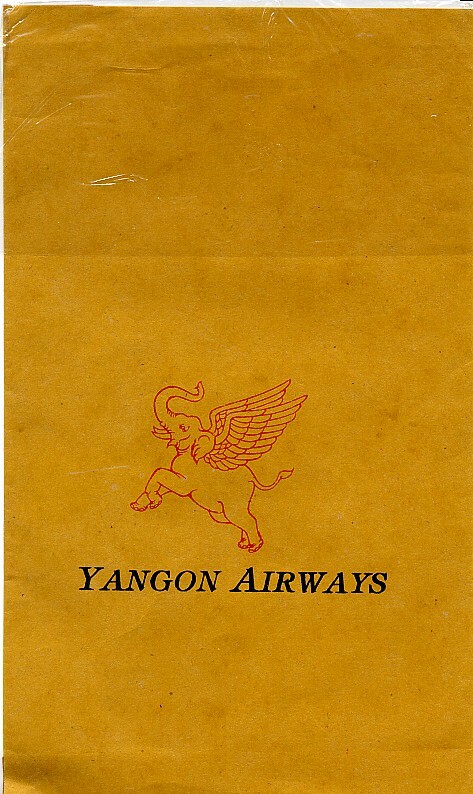 You just have to love any airline with a winged, stenciled, red elephant. It's reminiscent of operation Dumbo Drop. Don't you just love any word that has 'yang' in it? A very colorful bag from Myanmar. 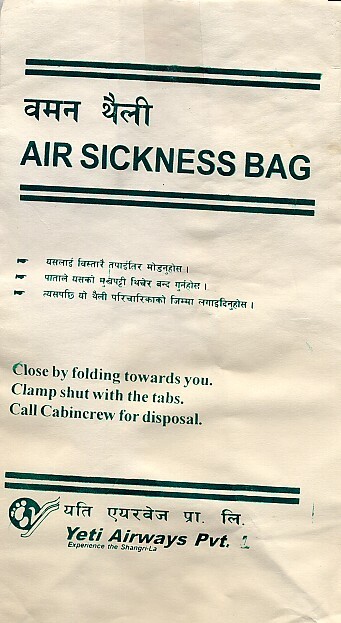 I love how the bag says "You're Safe With Us"! It's kind of like a restaurant whose slogan is "Our food won't make you sick"! Yes, this is a plain paper lunch sack. 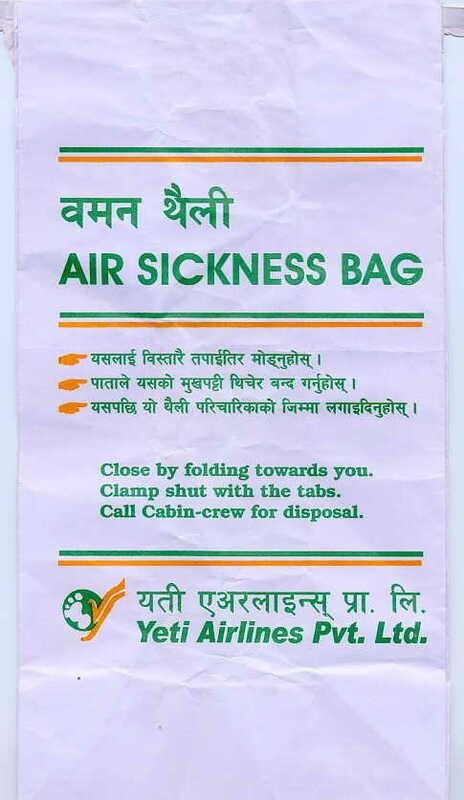 Although it may not be a bona-fide sickbag, this bag was obtained from Yelcho (Belcho? ), a Chilean Army ship in Antarctica. 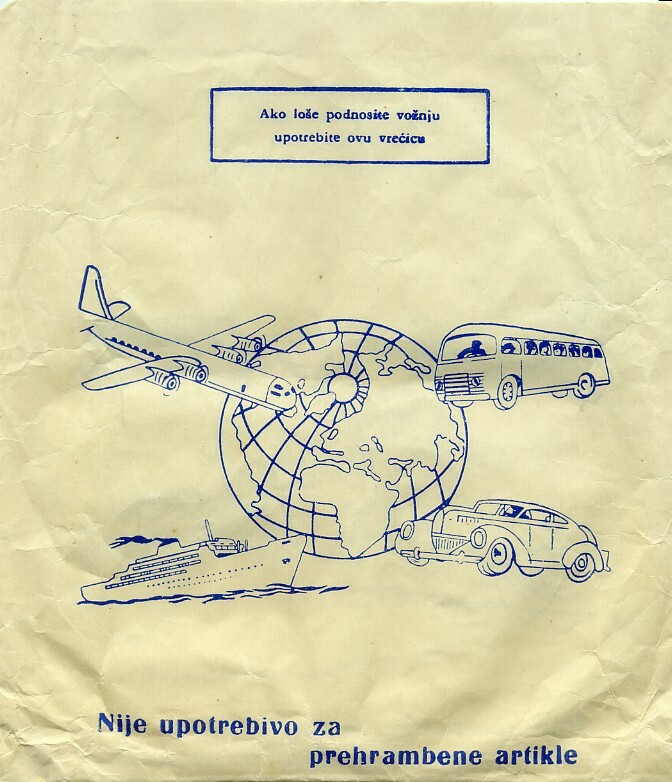 Nice art deco sperm logo -- probably a throwback to the time when the airline was called "Semenia". The blocky Arabic writing looks something like a mall's floor plan. Identical to 2009 version except there stars in the folds instead of some weird eyeglasses logo. 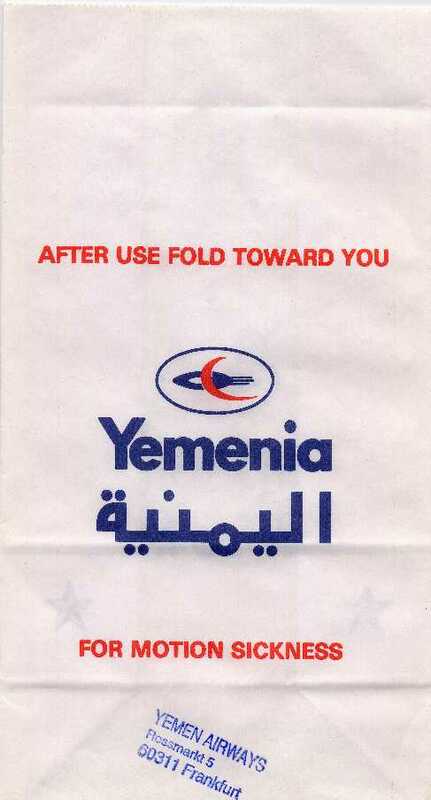 Identical to 2000 version except the stars in the folds have been replaced by some weird eyeglasses logo. I LOVE the logo which sports a big foot (as well as confusing DNA strands). The bag exhorts you to 'Experience the Shangri-La', which I thought was in China. I LOVE the logo which sports a big foot (as well as confusing DNA strands). 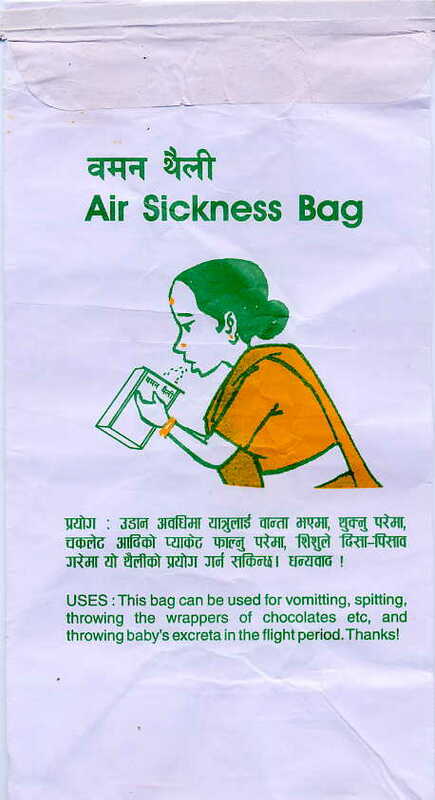 The famous barfing lady from Buddha Air appears on the back. Soon she'll be more popular than the IEEE lady. The coolest part of this bag is what you can't see. There is printing inside this bag! It's identical to what's on the exterior, but wow! And it features the monochrome barfing lady with straightforward uses such as vomitting, spitting, and throwing baby's excreta away. 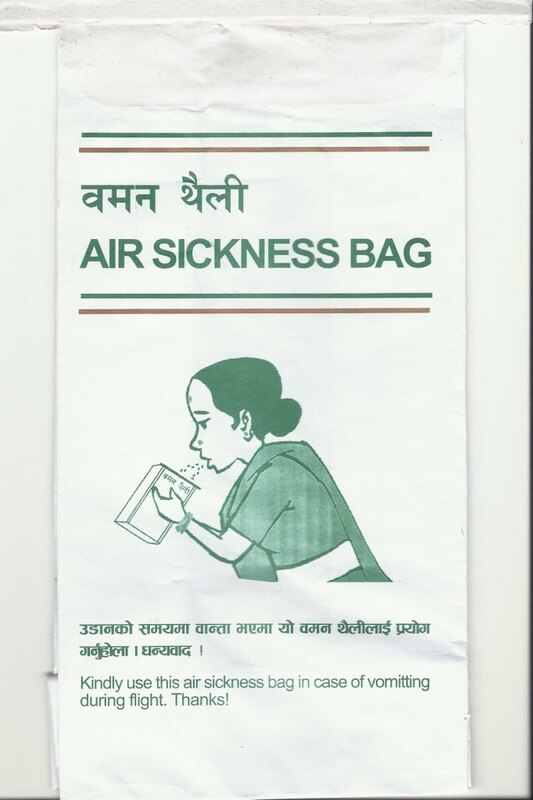 This bag is the similar to the previous versions except the text has changed. 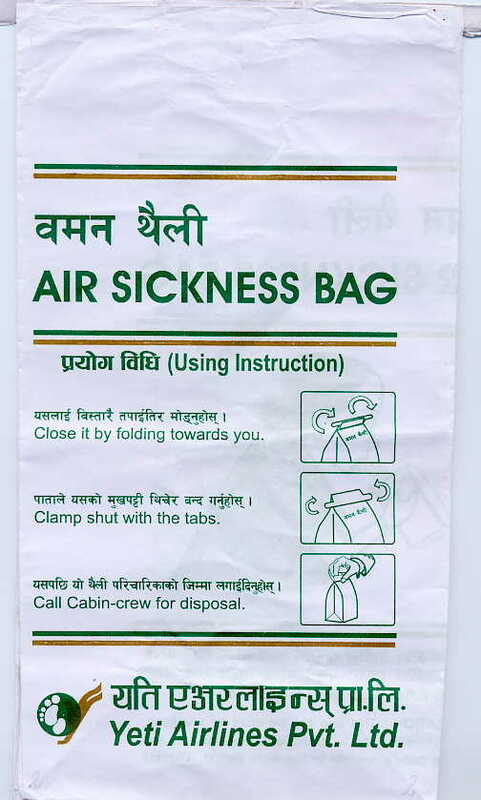 Now the bag is for vomiting only, not for spitting or peels like the previous version says. Although there is no airport in the city of Yichang near the Three Gorges Dam, the transportation system (bus? rail?) 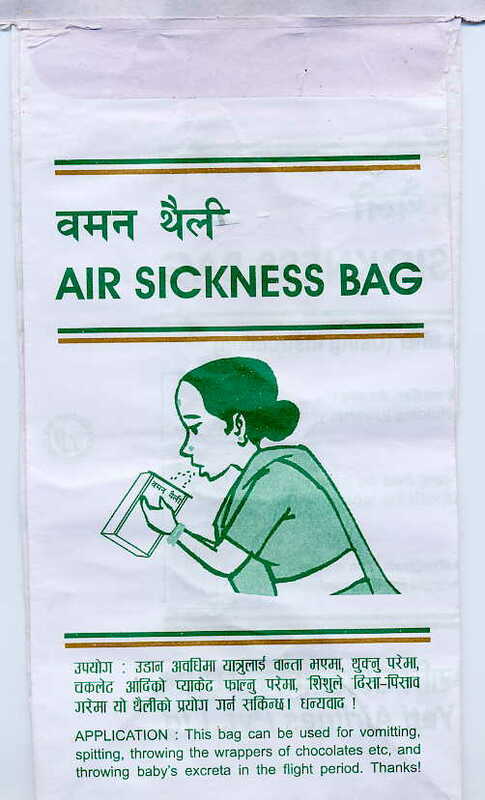 must be of sufficient lack of quality to merit this bag. This is quite possibly the best generic bag ever conceived. Clearly old and written in Serbian, it features a Eurocentric globe. 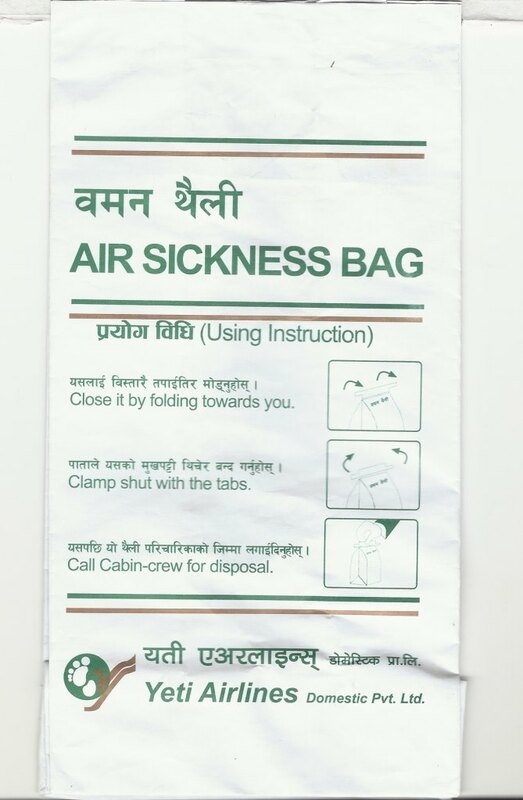 Krstarica.com had a tough time translating this bag. 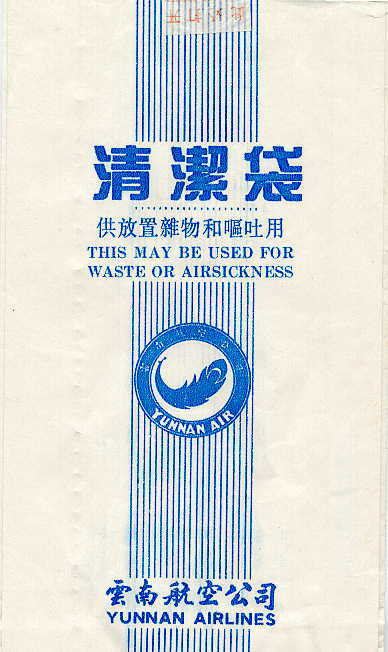 This bag looks eerily similar to China Yunnan Airlines. 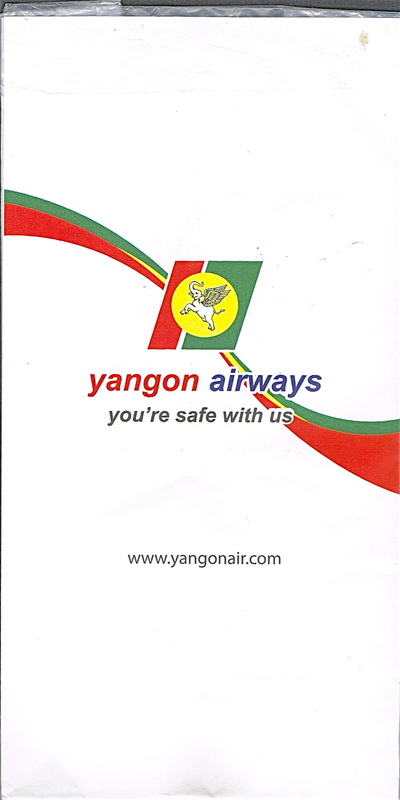 Could it be that Yunnan now reflects a more international carrier?